General Information: Creatine is one of the most proven and researched nutritional supplements on the market. There are many studies demonstrating its ability to improve strength, power, and endurance. Other people use it because they think it improves muscle mass and overall weight. Creatine’s potential water retaining side effect does not make it an ideal supplement for someone looking to lose or maintain bodyweight. It would only really make sense for strength and power athletes to take, as well as bodybuilders. Cost: There are a wide variety of expensive new-age creatine products out there in powder, pill, and even liquid forms. 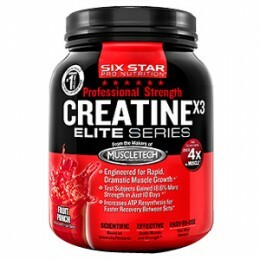 A lot of the newer more advanced creatine is pretty expensive but creatine monohydrate powder is usually pretty cheap. You can get a 2.2 lb tub for about $20 from many vendors including GNC, possibly less if it’s on sale. If you are looking to bulk up, you may also want to look into the Advanced Creatine from Body Fortress which includes a lot of simple sugars, electrolytes, and other nutrients to help with absorption. The Body Fortress Super Advanced Creatine 3 lb tub costs about $16 at Wal-Mart. Risks/Side Effects: Keep in mind though, creatine supplementation is relatively new and there are no long-term studies on possible side effects or dangers. Do not take creatine if you are pregnant, nursing, or have kidney/liver problems. Make sure to stay hydrated while taking creatine products as it may increase water retention into the muscle cells. I wouldn’t recommend taking more than 5 or 6 grams per day regardless of your size or goals.